Wye Hops : New Hop Variety Breeding Programme – Slowly slowly catch your new variety…. The breeding of any new plant variety is a science that requires patience. Wherever you look in the world the creation of new plant varieties takes time. Humulus lupus, to give it it’s latin name, which means wolf of the woods is dioecious which means that the male and female plants are separate. 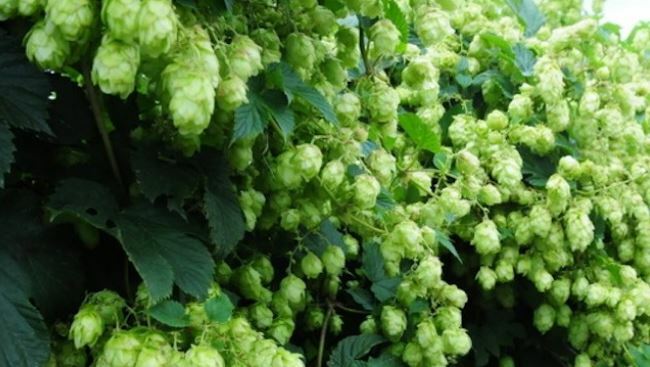 For historic reasons dating back to the early 1900s, in England male hop plants are grown alongside female hop plants. In the breeding programme, the males are not ‘killed’ but used as parents to develop new female varieties like First Gold. Dr Peter Darby, of the British Hops Association, uses the male hop plants mainly for their growth habit characteristics and to provide disease resistance in their female hop plant progeny. Hop Aromas with Stand Out: current breeding programme work is exploring wild American aromas and spice aromas.In addition we are revisiting the National Hop Collection every year to seek out old varieties worthy of trialing again today. Fuggle is under threat from verticilium wilt and every year acreage diminishes. In 2008, with IBD support, a crossing programme was initiated and in 2012 one selection, 19/6 has been confirmed as having wilt resistance. Initial brewing trials are positive so farm trials are being planned.